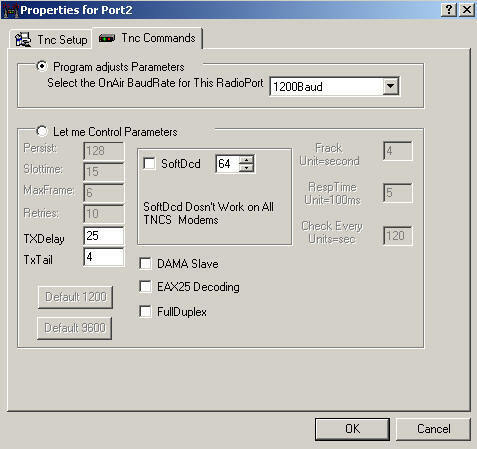 On the Properties screen for each sound card radio port, there is a second tab entitled TNC Commands. Selecting that tab brings up a screen where you can edit various traffic flow parameters. By default, AGWPE automatically resets seven of the parameters every few minutes -- a very valuable feature. But if you prefer, you can opt to manually set those seven parameters. This default choice offers a valuable feature: AGWPE monitors the packet traffic level and will automatically adjust all packet parameters every two minutes to match the traffic level AGWPE has detected. You can read more about how the program adjusts these parameters by reading the AGWPE Help file: from the AGWPE menu, select Help and then in the Contents, select How To .. Control TNC Parameters (SelfAdjust Parameters Algorithm). For example, AGWPE uses 8 traffic levels based on the number of bytes AGWPE has heard in the last 2 minutes, where "1" is little or no traffic and "8" is full channel capacity (defined as 15,000 bytes/2 min). The MaxFrame, SlotTime, and Persistency parameters associated with each traffic level are embedded in the program, but you can override some or all of those values with additions to the AGWPE.INI file (read the AGWPE Help file). If you keep this default setting, seven of the parameters on this screen will be 'grayed-out' and inaccessible, as will the Default 1200 and Default 9600 buttons. Note: The 'on air' baud rate field is not used by the program. TXDelay - the time in 100ths (.01) of a second between when the PTT circuit is activated and packet data is sent. This delay gives your radio's transmitter time to come up to full power and gives the receiving radio time to switch from 'transmit' to 'receive'. A minimum delay increases traffic flow, but too little delay may result in the loss of the beginning of the packet and no exchange. The default delay is 35 (350 milliseconds) for 1200 baud; 20 for 9600 baud. Older radios may need a bit more; newer radios may need 15 or less. TXTail - the time in 100ths (.01) of a second between the end of packet data and the closing of the PTT circuit. Only needed on some modems. Can be set to zero for most TNCs. Default is 4. Soft DCD - DCD is Data Carrier Detect. Some TNCs/modems must rely entirely on the radio's squelch to sense when there is a carrier/packet on the air (hardware DCD). If your radio does this, leave this unchecked. Other TNCs have software logic to detect when there is a carrier/packet in the noise, so you can leave the radio squelch open (software DCD). In fact, many TNCs are designed to run open squelch and use soft DCD automatically. Still other TNCs/modems let you choose which method to use. Check mark this box this if you want software DCD. The relative signal-to-noise threshold amount to the right can be changed. The default is 64. DAMA Slave - check this if you are working with DAMA stations. It will put the port in DAMA mode when it detects that the station you have connected to is a DAMA node or BBS (DAMA Master). DAMA is common only in Germany/Europe. DAMA replaces SlotTime and Persist timing. EAX25 Decoding - if there another station is operating in EAX25 mode, then checking this box will allow you to monitor its traffic correctly. EAx25 is not a standard protocol and many stations don't support it. Incorrectly activating EAX25 decoding could result in problems. Full Duplex - default is OFF, which means AGWPE uses the DCD signal to determine when the frequency is clear and when to acknowledge packets. When turned ON, AGWPE ignores the DCD signal and sends acknowledgements immediately; may be useful in split frequency operations such as through satellites or when doing loop-back tests, but only if both stations are operating full duplex. Note: PacLen, the number of characters to place in each packet, is determined by your application program, not AGWPE. AGWPE can sent up to 255 characters per packet. If traffic is light (collision risk is low), you can send more characters per packet and exchanges will be quicker. If traffic is heavy, use less characters per packet because shorter packets will have a better chance of getting through without collision. This means the need for retries will be less and exchanges will be quicker in heavy traffic situations. This choice lets you change seven additional parameters: Persist, SlotTime, MaxFrame, Retries, Frack, RespTime, and Check Every (see Parameters information below). In addition, the Default 1200 and Default 9600 buttons become active. You should only make this choice if the program is not handling the timing parameters to your satisfaction and you understand channel traffic and the affect of each parameter. Remember that AGWPE can adjust the parameters automatically as traffic levels change, something that would be difficult to do manually. Persist - works with the SlotTime parameter to determine the frequency of transmissions. SlotTime sets the time between slots (transmission opportunities). Persist sets the odds (the number of times in 255) that AGWPE will actually transmit when a slot come up. Use lower Persist numbers during heavy traffic (so AGWPE misses some turns and lets other stations transmit). Try higher numbers if traffic is light (AGWPE will transmit at most slots). Persist can be from 1 to 255. Default is 128 (50%) for 1200 baud; 190 (75%) for 9600 baud. SlotTime - works with the Persist parameter to determine the frequency of transmissions. After detecting a clear channel, the SlotTime is the time in 10 milliseconds that AGWPE waits for the next slot (transmission opportunity). The Persist parameter sets the odds that a transmission will actually be made at that slot. Default is 10 for 1200 baud; 5 for 9600 baud. MaxFrame: the number of packets (frames) of unacknowledged packets that can be outstanding at one time. When MaxFrame is reached, AGWPE will stop sending packets and wait for an acknowledgement from the other station that ALL packets were received. If traffic is light, use a higher MaxFrame -- packets will get through more quickly. If traffic is heavy, use a lower value. Otherwise, a lost frame will result in a request from the receiving station to re-send ALL frames after the lost frame. This adds traffic to the channel. The maximum MaxFrame value is 7. Retries: if a packet is not acknowledged by the receiving station, AGWPE will re-send the packet up to the maximum number specified by Retries. After that, the connection with the other station is assumed to be broken and it is closed. Default is 10 for 1200 baud; 15 for 9600 baud. Frack: increment to wait for an acknowledgement from the other station before re-sending the packet. Allow more time if you have more VIA stations in your packet address path. Default is 10 for 1200 baud; 8 for 9600 baud. RespTime: the minimum delay to wait after a clear channel before sending an acknowledgement packet. This delay helps ensure all the sending station's frames have been sent. Increments of 100 milliseconds. Default is 5 for 1200 baud; 3 for 9600 baud. Increase this if your ACK packets may be colliding with the other station's last info packets. Check Every: the amount of time to wait after hearing nothing from a 'connected' station before sending a 'check' ("are you still there?") frame. Default is 180 (3 minutes) for 1200 baud; 120 (2 minutes) for 9600 baud. Default 1200 Button - will set all the parameters to AGWPE's default settings for 1200 baud 'on air' packet. Default 9600 Button - will set all the parameters to AGWPE's default settings for 9600 baud 'on air' packet.